This is not the type of book that I typically go for. Dystopian fiction, in general, is not really my thing. I don’t love the hopelessness brought on by thoughts of the end-of-the-world, the fear of being one of a few survivors of an apocalyptic change, or, perhaps worse, the fear of not surviving it. 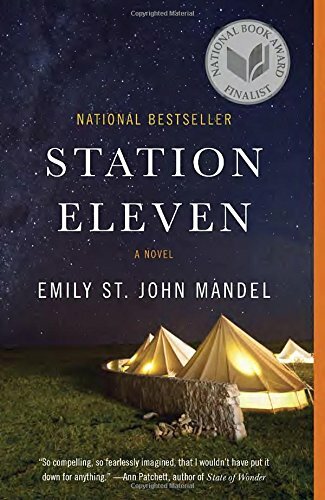 After so many recommendations and great reviews, however, I decided to read Station Eleven by Emily St. John Mandel and I am glad that I did. The post-apocalyptic tale begins with a performance of King Lear in Toronto in which tragedy befalls the lead actor. The actor's fate is quickly overshadowed by the rapid spread of a deadly flu that wipes out most of Earth's population within weeks. The novel follows the lives of various characters, but most specifically a group of actors and musicians who travel in a pack performing symphonies and Shakespearian plays calling themselves the Traveling Symphony, as they attempt to survive in a post-apacolyptic world. Mandel is an excellent storyteller and she creates as much a mystery as a dystopian novel by cleverly interweaving her characters' lives and fates. The flashbacks interspersed throughout the book tie the past (pre-flu era) to the present in a way that makes it impossible not to be intrigued. She paints fascinatingly terrifying visions of what the post-pandemic world is like and describes them mostly from the perspective of Kirsten, one of the children in that production of King Lear in Toronto, who is now an adult player in the Traveling Symphony. She forces her readers to confront the violence and rawness of human nature in the absence of security. My favorite line from the book is "Hell is the absence of the people you long for." I found this book so compelling, I had trouble putting it down. For four days straight, I had trouble thinking of much other than what it would be like to live in a Station Eleven world. Mandel did not convince me to continue reading dystopian literature, but I give this book high marks for its creative story and excellent character development. It is well worth your time. Thank you! A confirmation message is on its way to your inbox. Do you supplement? Kristin now will...! Jack at Seven Years Old! I often link to resources that I personally use and recommend. I participate in the Amazon associates program and if you go to Amazon through my blog (by clicking on the embedded links) and then make a purchase, I could receive a small commission on the sale, although it will not cost you any extra money. The compensation received will never influence the content, topics or posts made on my blog, it is simply a way for me to earn a little money which might even cover the cost of web hosting one day. Your support is very appreciated.